The typical installation is for an exposed front, under mount application. This work needs to be done before arrival of the sink. As dimensions vary sink to sink, we always express (OD) outside dimensions. L” x W” x H”. 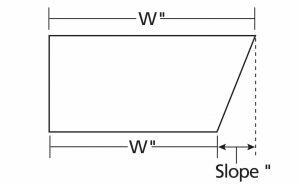 *Slope will be the distance the bottom of the front is set back from the top dimension. 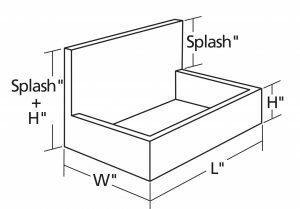 *Splash height will be above H” of sink. A. First operation is to prepare the face of the cabinet for the sink. 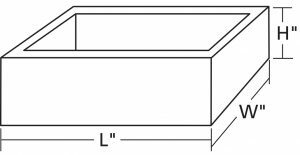 Using the length (L”) and height (H”) cut the face to fit the sink. B. Next is to prepare support for the sink as it is too heavy to hang under the counter. As cabinetry is built in a number of ways this is a suggestion and needs to be modified by the cabinet maker/contractor to fit your construction. 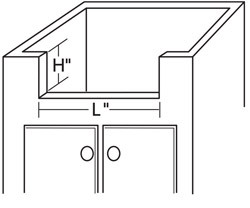 The sink needs to be supported left and right or front and back, it does not require full support below. 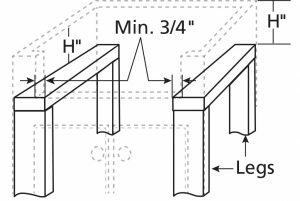 The use of cleats and legs left and right is most typical, set the support down H” from the top of cabinet with a minimum of 3/4″ available to support sink. Considerations: soapstone sinks are heavy (75-150 pounds) so sheetrock screws and strapping are not going to do it. Level, it needs to drain. The plumber needs to be able to get drain and water feed lines to the sink.